Looking for industrial gearboxes then look no further. Let us introduce you to some of the services that we offer in the Gearbox and Power Transmission field. We believe that our service and quality is beyond doubt and that your company would benefit from our vast experience in the gearbox industry. Established in 1995,we are now celebrating over 20 years of personal service. When a Gearbox is obsolete or a new application is required we are able to select and quote for new Inline, Right Angle, Planetary, Fixed or Variable speed units. We supply all the leading manufacturers of industrial Gearboxes including:- Nord, Renold, SEW, Lenze, KEB, Motovario, Baldor, STM, Stober, Fenner, SITI, Swedrive, Varmec, Benzler, Opperman, Dodge, Zeromax, Tramec, Hub City, Spaggiari, Siemens, Rehfuss, Knodler, Radicon, Flender. 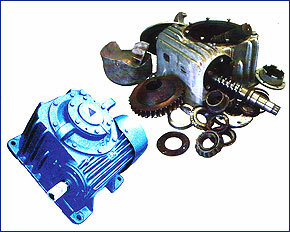 We also supply an alternative to most of the gearbox range previously supplied by David Brown. Please select our Industrial Gearbox page for the full range of Industrial Gearboxes and gearbox reconditioning. Our engineering workshop is equipped to offer a comprehensive Industrial Gearboxes and gearbox Reconditioning services. Our experienced, qualified staff give a high standard of workmanship by fitting only quality bearings and seals along with manufacturers spares. When a unit is obsolete and genuine spares are no longer available, we have access to manufacturers original drawings and can reproduce components to the correct specification required. Within 24 hours of receipt of your unit we give you a free no obligation quotation, and when the units have been reconditioned they are dispatched with our 12 month guarantee. We also specialise in Inverters, clutches, clutch/brakes, brakes, couplings and other related transmission products. Should you require any bespoke machined items such as shafts, gears, pulleys, sprockets etc, just send us a sample or technical drawing and we will be pleased to send you a competitive quotation. We offer a full Engineering package, so should you wish to discuss the above in greater detail or you have an enquiry just call or fax us on the numbers below. We look forward to impressing you with our services.